Things are still very quiet in Avon, in fact they can only get better. I blame it on the lack of cold and easterly weather. I have still only seen a small number of Redwings, only seen one Fieldfare and not heard an autumn Brambling yet. We seem to be locked into westerly airflow that even the the weathermen cannot predict the strength of recently. For the last 3 days there has been nothing but reports of gales, 70 mph gusts etc. coming our way up the Severn Estuary. Every one was expecting a few Leach’s Petrels this morning only to wake up to a gentle breeze. Well at least I still have a garden fence. 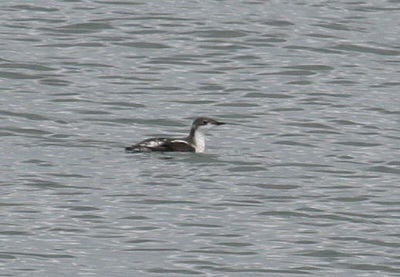 Avon birding is so quiet at the moment, that when I received news that Britain’s first Long-billed Murrelet had been relocated at Dawlish in South Devon I immediately made the 90 mile dash down the M5 to see this once in a lifetime bird. This was my first new British bird for over two years having resisted the urge to see lesser rarities. I wasn’t leaving much behind other than a late Wheatear at Severn Beach. Despite taking numerous pictures of the Wheatear and close examination of the results, I couldn’t make it into anything other than a Northern Wheatear. The weather remains mild for the time of year, many trees have yet to lose their leaves and I have still only seen one Fieldfare this autumn. The appearance of the Devon Murrelet still gives me hope of a few more good birds locally but not quite as rare. One lucky observer saw a Goshawk being mobbed on the coast not far from my home yesterday. This was a rare sighting and prompted me to visit some more likely wooded habitat South of Bristol. The wood that I visited was as good a looking site you might expect to find one of theses rare Avon birds. Needless to say I was unsuccessful but I will attempt visit the area again if I have enough time. I received news late this morning of what was almost certainly a calling Richard’s Pipit flying south over Northwick Warth. I searched the area thoroughly this afternoon but only managed to “nearly step on” another Jack Snipe. A Short-eared Owl showed well again on Aust Warth this afternoon. A Whooper Swan was reported today opposite Avon at Goldcliff, Gwent. Hopefully it will be found a few miles east later this week. After a cold night and a morning frost I decided to search the salt marsh at Severn Beach in the hope of finding either Lapland or Snow Bunting or even a Shore Lark, all of which have been seen here before. I had to settle for a Jack Snipe that typically took off only when I had nearly stepped on it, my first Water Pipit of the winter with 4 Rock Pipits and a reasonable number of Skylarks. The cold weather brought in the first decent flock of Dunlin with at least 4500 feeding off Northwick Warth. In the evening I missed the Short-eared Owl at Aust Warth but had my first single Fieldfare of the winter. 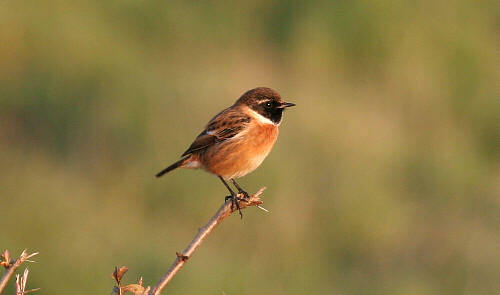 A pair of Stonechats showed well on a hedge here catching what must be the last few flying insects of the year.